In addition to our list below, click here to visit a good Cyclists' Cafes website. This list is incomplete. Please notify any changes or additions. If intending to visit Belgium, scroll down to the bottom of page for details of a great cafe and overnight stop near Ypres. Cafe open 10am - 4pm every day. JJs Diner Cafe, Burnley Road, Cliviger. Highly recommended. Post Office Cafe (sadly closed down on last visit). Nearby Hellifield Station café available. Open Sundays and Bank Holidays from Mothers Day until the end of October. Clarion House, Jinny Lane, Roughlee. Noggarth Top Farm, Noggarth Lane, Roughlee. Owd Barn Country Store and Tearoom. Open daily 10:30am - 5:30pm, licensed. Open Tuesday - Sunday 10.30am - 3.00pm (can vary). Recommended - great home-made soup. The Little Shop Newsagent and Café on the main street. Cafe downstairs. They do (or used to do - please check before visiting) a big breakfast for £10. Eat it all in 20 minutes with no drink to wash it down with and you get it free. 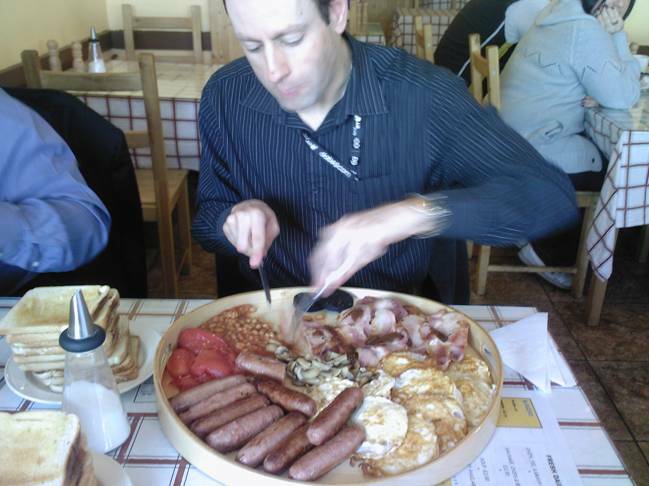 It's 10 eggs, 10 rashers of bacon, 10 sausages, 10 slices of toast, 5 black puddings, tomatoes, beans and mushrooms. No Chips !!! Have a look at the photo below for a proper breakfast. STOP PRESS - THIS CAFE NOW MOVED ACROSS THE CAR PARK TO THE MAIN BUILDING. If you are in the Ypres area in Belgium please call at the Cherry Blossom Tea Rooms. You will be made most welcome. We visited on the second day of our Bury to Schorndorf Cycle Tour in May 2006 and were treated very well. A warm welcome and large portions greeted us. Liz and Jon Millward head a family run business situated in Brandhoek, Ypres, Belgium. The B&B, tearoom and cafe is now well established. All their food is freshly prepared and Home Cooked (English Menu available). They are on the main Flanders Cycle Route. Photo below. Above is the exterior of the Cherry Blossom B&B and Cafe in 2006. 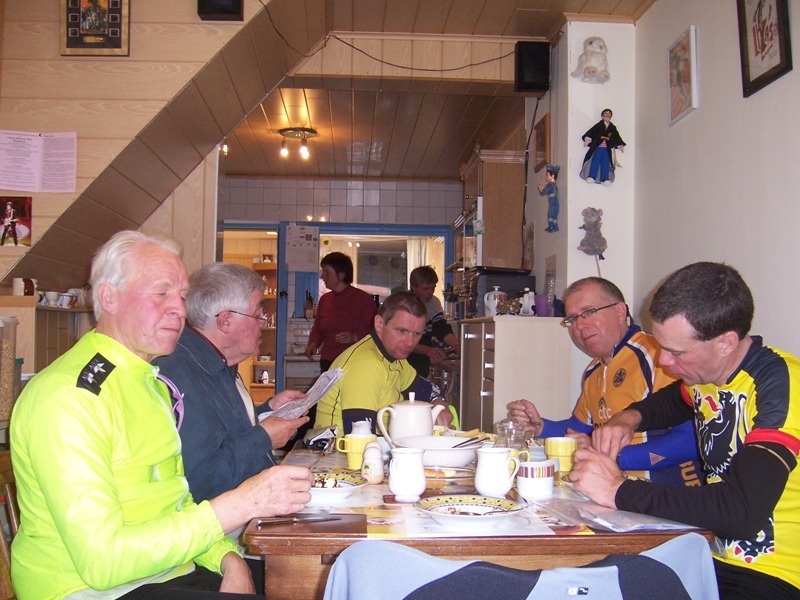 Below Bury cyclists enjoy the food and the hospitality in 2006. Owners Liz and Jon are in the background of the picture.